Summer is here and Meow! has tons of new affordable, planet-friendly seasonal fashions, including lots of new arrivals. Come check out our summer dresses, skirts, jewelry, tops, and t-shirts! We also have a great collection of summer bags, as well as the usual assortment of vintage vinyl records, movie posters, and neat stuff! 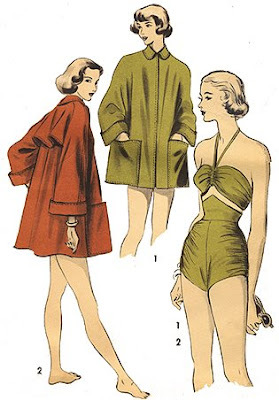 Although we do occasionally receive both vintage patterns AND vintage bathing suits, we don't currently have the ones featured on the pattern envelope above. So sad! Thanks for stopping by!